The last week of school is here and it’s full of class parties, field days, and finals! We are all ready to have some fun in the sun! 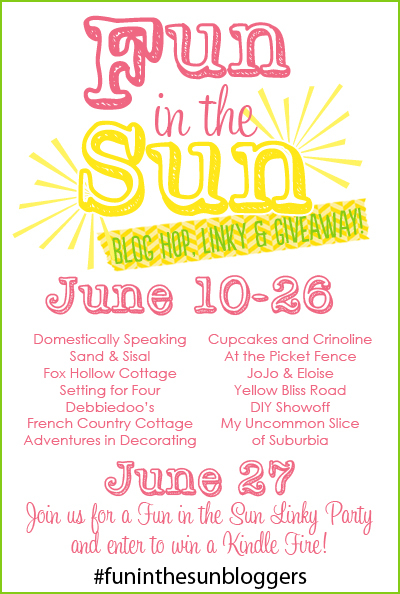 For the next two weeks I’ve teamed up with an amazing group of bloggers who will be sharing some fabulous summer crafts, recipes, decorating ideas and so much more. My in-laws are about to arrive for a visit, then we’ll head to the beach for a vacation. I wanted to have a nice dinner and a pretty tablescape for them, but I don’t have a lot of time to fuss over the decor. 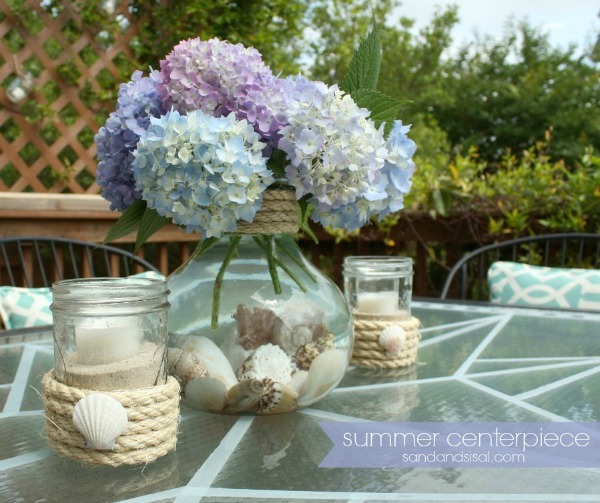 So I thought I’d share with you this super fast and Simple Summer Centerpiece. It’s perfect for casual summer dining. Step 1) Fill the bottom of a vase with clean shells. Step 2) Wrap neck of vase with sisal rope and secure in a few places with hot glue. Step 3) Fill with water and flowers. When you add the water the shells will look twice a big! 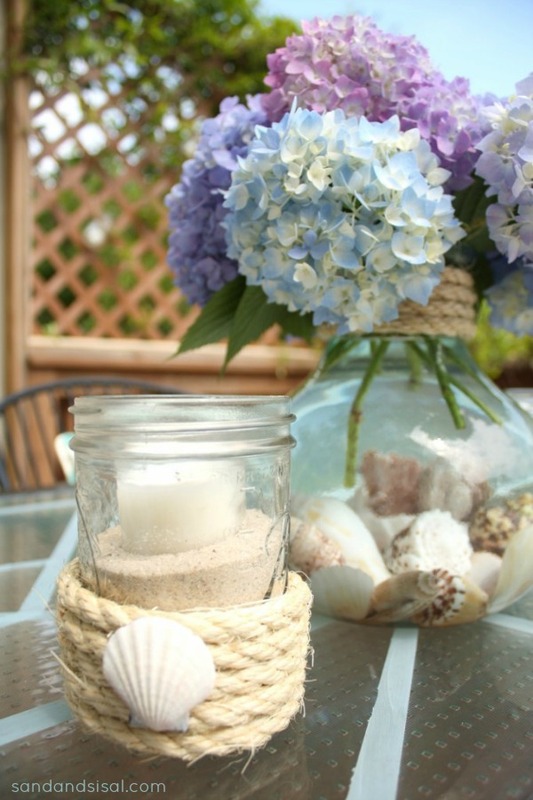 To make the Summer Sisal Votives, wrap the lower 1/3 of a clean mason jar with sisal rope and secure with hot glue. 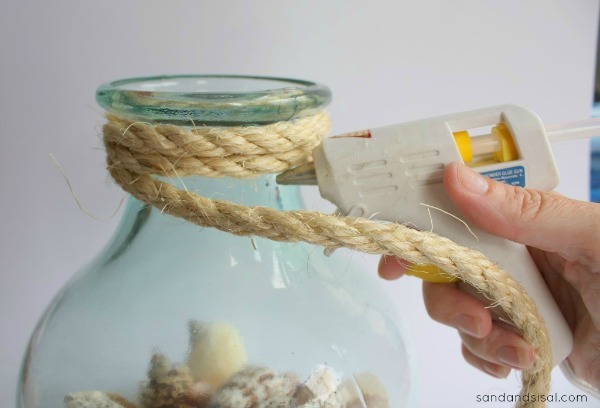 Decorate the rope with a shell, hot glued on. Fill jar 1/2 full with sand and insert a votive candle in the sand. 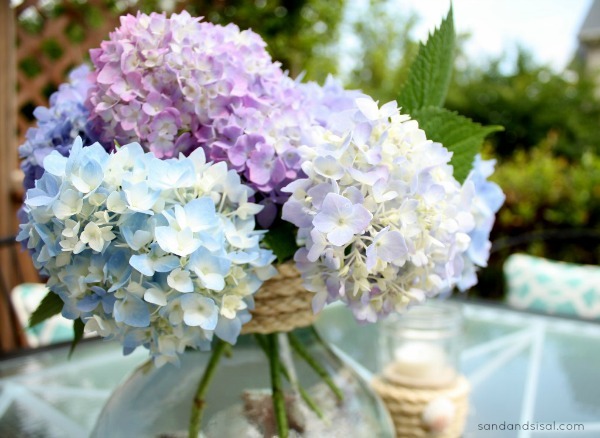 I love how quick and easy this was to make and super inexpensive because the flowers came from my hydrangea bushes. 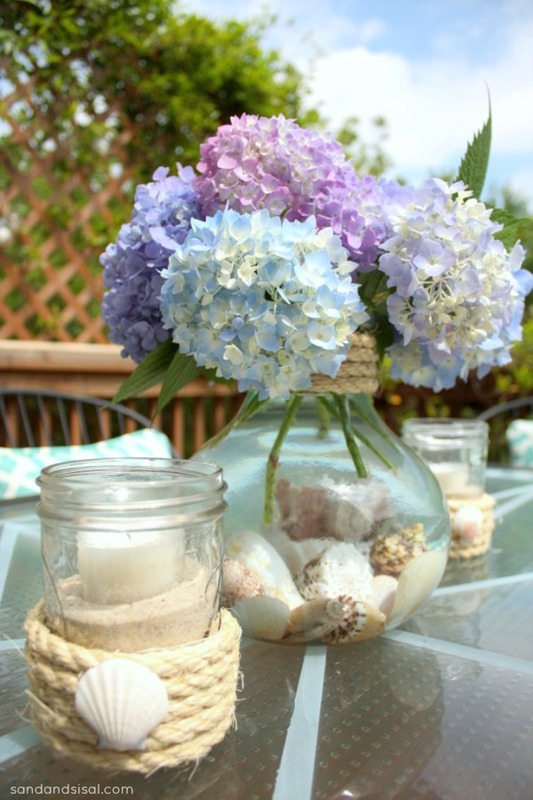 The Simple Summer Centerpiece is displayed on my faux etched glass table on the deck. Won’t dinner be lovely outside? 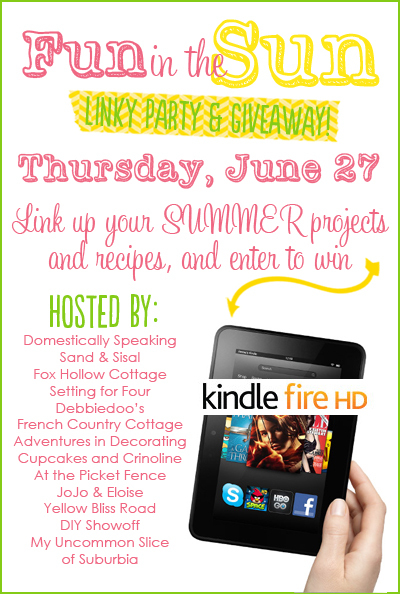 Later this month on Thursday June 27th we are wrapping up the blog hop with a huge link party and giveaway. That is so simple and so great! I have so many shells from years of vacation, now I know what I can do with some of them. Love the etched table! PS: The table top looks really cute too, love that etched design!! Pretty, pretty. 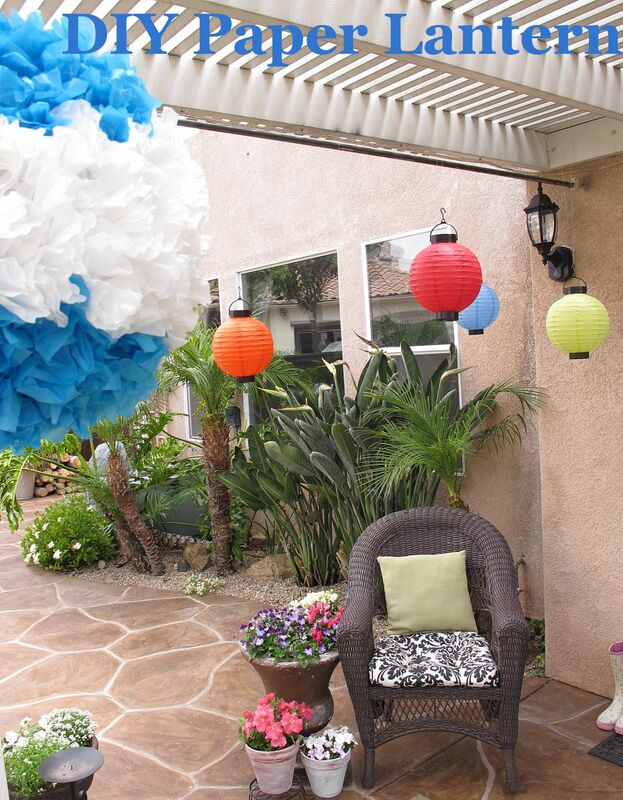 See I brought out the shells, cut the hydrangea flowers… but it took you to tell me to out them together! Luv it! Beautiful centerpiece, Kim!! 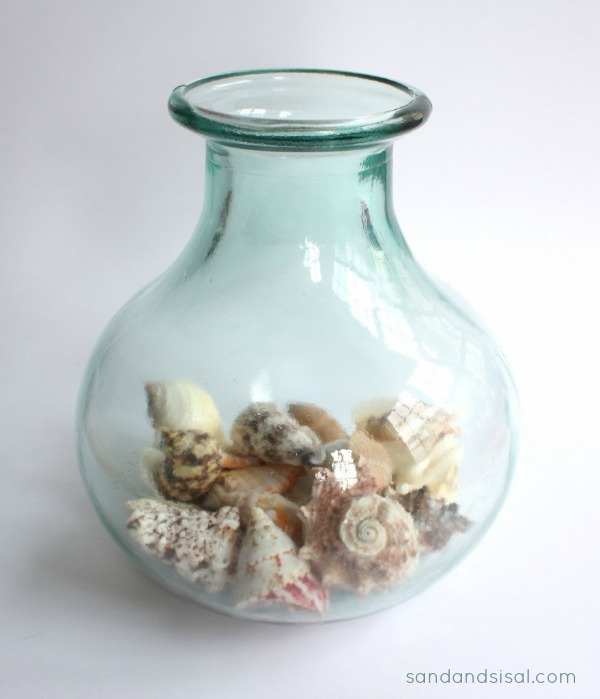 I have never seen that concept of putting the shells in the vase water but it is so very pretty. So beautiful Kim! I love the touch of rope for a summery feel! 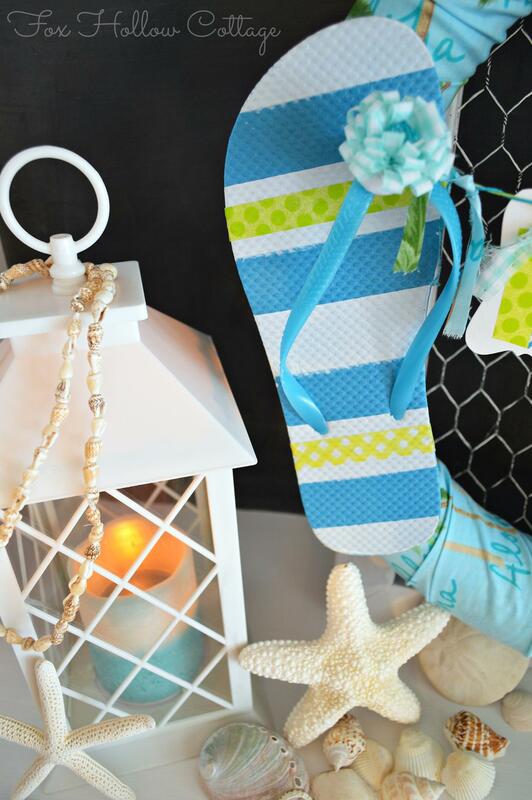 I have lots of shells from Virginia Beach I can use to make this project too! Shared and Pinned! Love it all! Wanted to go through those I’ve never visited and clicked on stop 11 but it’s the wrong link. Thought you might want to know. It’s beautiful Kim! I love the coastal vibe. It is just gorgeous Kim! Love the shells at the bottom! Have a fabulous time with your in-laws and the beach! So happy to be hosting the party with you. This is absolutely BEAUTIFUL!!! I LOVE everything about it 🙂 I am a HUGE Hydrangea fan..I have FAKE one’s all over my house. LOL!!! So fun Partying with you, FB-ing and Pinning!! 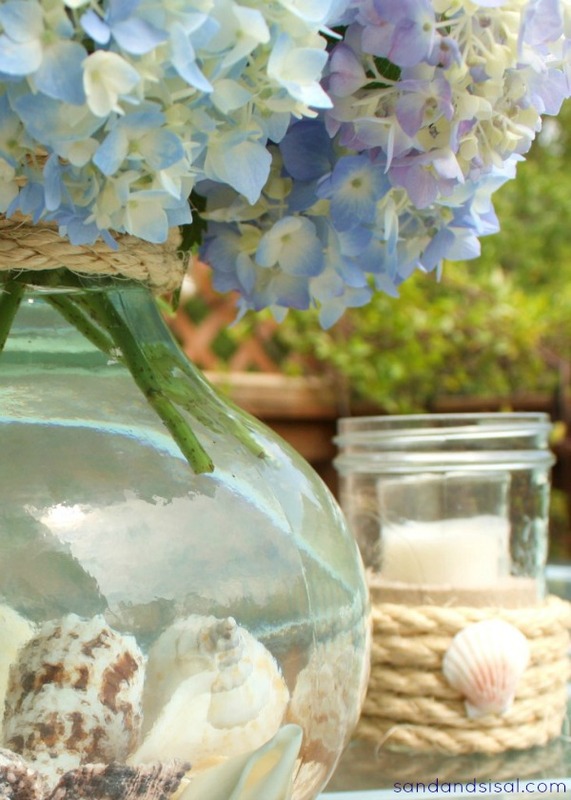 So gorgeous~ I love the mix of the hydrangeas with the shells- soo pretty!! Wow!!! This is my kind of table decoration……simple yet elegant. 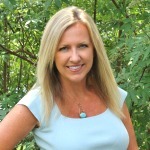 Way to go, Kim! Love this centerpiece and look forward to more this summer. I need ideas for my home badly!